A message on your smartphone or tablet warning that your device is infected with malware is cause for concern. If you've never installed the type of antimalware app that would produce that type of warning in the first place, it should be an even bigger red flag. Fake antivirus and ransomware attacks--a staple of PC-based malware in recent years--are making their way to mobile platforms. Fake AV displays a false malware detection in an effort to con you into paying for software to remove the infection, while ransomware locks up your system (or mobile device) and prevents you from using it at all until the ransom is paid. Android is the primary target of mobile malware, and fake AV is no exception. Symantec has detected a new threat, which it has dubbed Android.Fakedefender. According to Symantec, this particular threat has elements of both fake AV and ransomware attacks. The alert is designed to look like a malware scan has detected an infection, but it also locks the Android device and prevents you from doing anything else until you pay the fee to download the "protection" app. Once the malicious app is installed, the real fun begins. The malware has compatibility issues with many Android devices, and attempts to prevent other apps from being launched. It alters the settings of the Android OS itself, and in some cases requires a hard reset to restore normal functionality. I've never understood why or how fake AV attacks succeed. If you don't have any security software installed, it should be obvious that the malware alert itself is the threat. How can you get a warning about a malware infection if you haven't installed any tool capable to detecting and warning you about a malware infection? If you have installed security software, then you should have a clue about how that software works and what the alerts looks like. 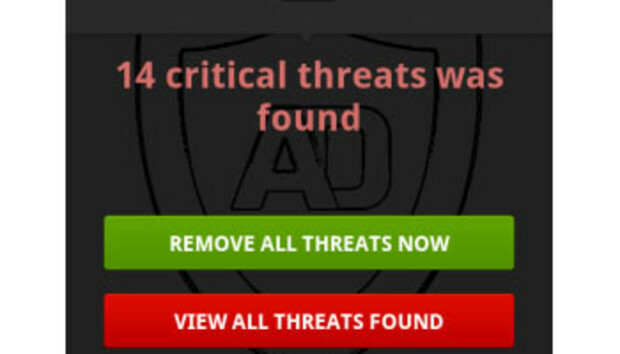 Even if the fake AV alert is designed to look identical to the alerts from your security software, no legitimate software developer would ask for more money to block or remove a threat. The best way to avoid malicious apps is to stick to mainstream apps from trusted sources such as the Google Play store. Android is open and allows you to download and install apps from virtually anywhere, but those apps might not be vetted and often can't be trusted. For additional protection, you can install an antimalware app on your Android device. McAfee AntiVirus & Security and Symantec's Norton Mobile Security are two of the most well known.